Tom Hardy’s performance in “Venom” is a Jekyll and Hyde vibe mixed with the physical comedy of Jim Carrey. Yes, this is a very different Marvel movie. When news hit that Sony was making a Venom movie, fans of the legendary comic book villain probably immediately thought that it has to explore certain things, and the character’s look and tone have to be a certain way. 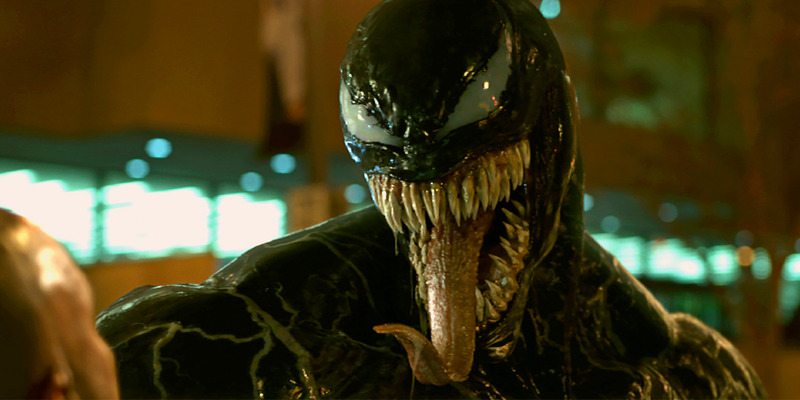 I’m going to level with you – if you are a superfan of the Marvel comics you probably are going to hate “Venom” (in theatres Friday). But if you are someone, like me, who did not grow up on the ultra-violent exploits of this alien Symbiote that clings to a human host to survive, there’s hope. With “Venom,” director Ruben Fleischer (“Zombieland,” “Gangster Squad”) delivers an entertaining comic book movie that at times is intentionally funny, while other non-funny moments miss the mark so badly that you can’t help but laugh. The worst parts of the movie are when it attempts basic character development. Whether it be the first 45 minutes or so where we watch the self-destructive life of Eddie Brock (Tom Hardy), Carlton Drake’s (Riz Ahmed) obsession to find the proper host for his Symbiotes he plucked from space, or the non-existent relationship between Eddie and Anne Weying (Michelle Williams). Obviously all of this is needed or the movie would be 30 minutes long, but it’s easy to zone out during these parts until Venom shows up. And when he does it pays off, but maybe not the way you would think. The plot of the movie revolves around Drake having these Symbiotes and his struggle to find a human host for them that won’t die while they are inside them. Eddie, who is an investigative journalist, gets a tip from one of Drake’s scientists (Jenny Slate) about what he’s doing and sneaks into Drake’s lab to see first-hand what is going on. And that is when he contracts the Symbiote, Venom. From that point on the movie kicks into a gear that fans of the Marvel movies will need a second to adjust to. Because things get very wacky. Yes, numerous Marvel movies (whether they be from Disney’s MCU or from Sony or Fox) have a comedic feel, but none have had Tom Hardy’s brand of funny. 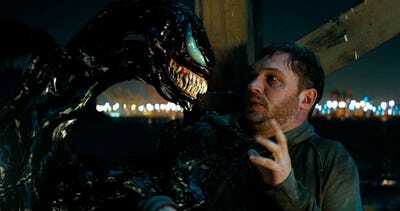 As Eddie tries to deal with Venom inside him, Hardy portrays that uncomfortable adjustment by giving a performance that’s a Jekyll and Hyde vibe mixed with Jim Carrey physical comedy. And then there’s the voice of Venom inside his head, which is the best part of the movie. Seriously, if the whole movie was Eddie and Venom arguing about the ethics of biting people’s head’s off and tater tots (that’s right, Venom loves tater tots), I would be the first in line for that. There’s also the stuff that clearly is not in the movie for comedic reasons, but is in fact just that. It’s what makes the movie distinctly batty (and in some people’s eyes, unwatchable). Dramatic lines, corny plot points – there’s literally a moment in the movie where Anne apologizes to Eddie that Venom is no longer inside of him. Honestly, how you get through this movie all comes down to how you see it. If you go with a group of friends, all of this just elevates the absurdity and pure enjoyment of this bizarre dark comedy. If you go see this alone… yeah, we don’t recommend that.